Fifth and last article of this series dedicated to everyday life of St Kilda’s inhabitants. After articles about food and work, spiritual and political life, St Kilda mailboat, read now about housing. Did you dream of a superb and peaceful house, with an unobstructed ocean view? So this article was written for you. Continually inhabited between the Bronze Age and 1930, the archipelago keeps more or less visible marks of this human occupation. The oldest ones are the more enigmatic. We talk about vast enclosure made of stone, probably used only for sheep. 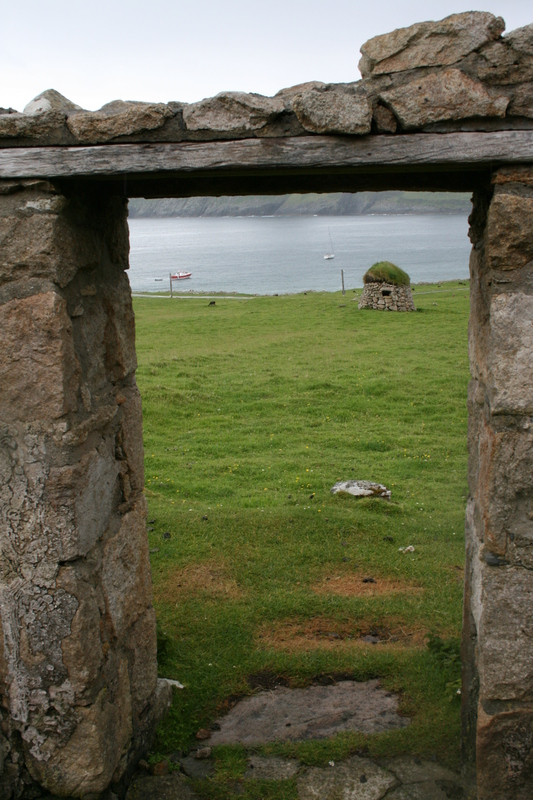 In Gleann Mor, the other side of Hirta, about twenty structures remains, unique in Europe, can be seen. Archaeologists failed to identify them. That’s where we can find the famous Amazon’s House as well. Another human construction on Hirta, the Cleiteans, was used as a shelter for animals, to store tools and food. Those little structures made of stone, dome-shaped, covered with grass, look like the hobbit’s houses in JRR Tolkien’s world. About 1200 of them are present on Hirta, used until the evacuation of the island. Some of them can be seen also on Boreray and even on the very steep Stac Lee. There, it is a refuge on the slopes of the cliffs for birds’ hunters. In the Middle-Ages, the village is located at about 350 metres from the shore, down the Conachair. It is composed of about thirty black houses, the Hebrides traditional houses with a surrounding wall to keep animals off the cultivated lands. Village Bay – View on the black houses in 1830 (the ones with a zinc roof dated from the years 1830). Around the Cleitans, at the end, the surrounding wall. 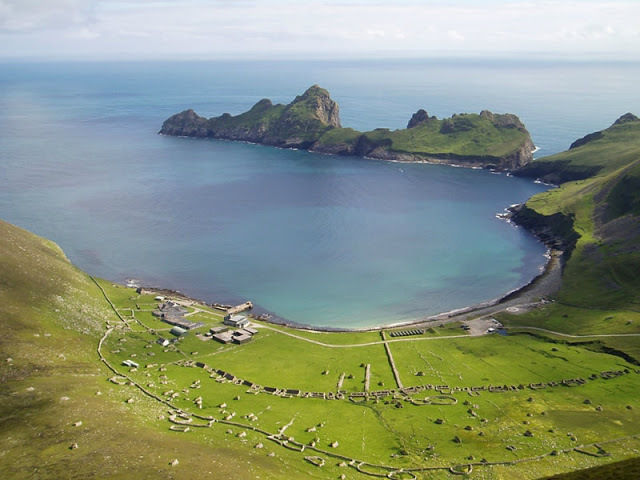 At the beginning if the years 1830, Thomas Dyke Acland, a British government MP, while visiting the island, is particularly shocked by Hirta’s inhabitants living conditions. So he gives money to allow the construction of 30 new black houses. Village Bay is built 200 metres further down, with a surrounding wall as well. In 1860, a strong storm damages several of these constructions, and as a consequence, they are reinforced. New zinc roofs replaced the roofs made of grass. Some of the black houses, seriously damaged, are turned into barns. At the heart of a little magnificent bay, comfort is however very rustic for St Kilda’s inhabitants. Walls of the houses are very thick, built without any mortar and so dark. Except the low door, there is generally only one marrow window, in addition to a little opening in the roof to allow smoke getting out. Indeed, because there is no wood on the island, the inhabitants used peat for heating. The hearth, placed in the centre of the house, dirties the walls darkened with soot. There is only one living room used as a kitchen, bedroom, dining room…. In winter, the livestock takes up a part of the house. 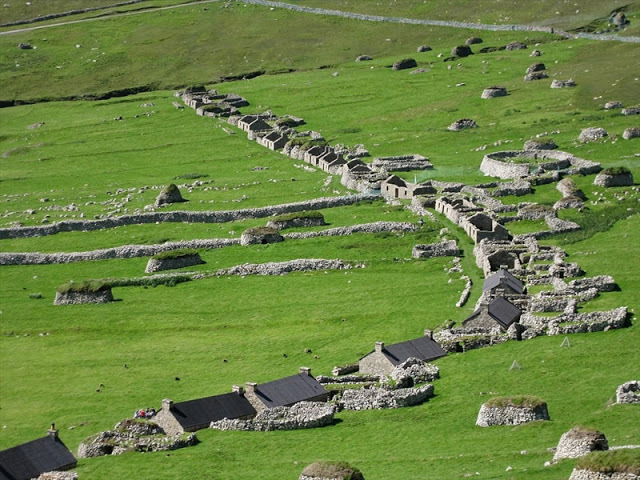 This hard everyday life is fate for St Kilda’s inhabitants until they move in 1930. The ocean view is not enough. In 1957, a scientific and military base is settled on the island, starting point of a new era. Tags: St Kilda archaeology, St Kilda black houses, St Kilda cleiteans, St Kilda history. Bookmarquez ce permalien.